Inspired by purple, the iconic colour of royalty, our Purple 3 Wick Candle is elegantly presented in a purple glass votive jar, with all natural wax and a 3-wick construction to exploit the strong, captivating fragrance blend of honeysuckle, amber, lilac and jasmine. Introduce uplifting colour and pleasing floral fragrance to your home with this elegant 3 wick candle. This wonderful luxury candle is designed to lift your mood and inspire brightness in your home, both in its attractive and colourful design, and its medley of carefully-selected natural floral extracts. Our Purple Moods collection candle contains natural floral extracts that invoke the soothing and comforting hue of this wonderful colour. We’ve combined the sweet floral aroma of jasmine and honeysuckle with the soothing and peace-inducing fragrance of lilac to create an enriching base bouquet, conjuring the subtle femininity and natural smoothness of purple. To add richness and depth to the purple bouquet, the natural, hand-poured blend is finished with a touch of amber. This woody, warm, musky and honey-like fragrance helps to embolden the overall fragrance, recreating the deep hue of this attractive colour. 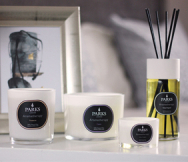 Our Purple 3 Wick Candle is exclusively available as part of our exciting Moods collection, a series of carefully-developed home fragrances developed to inspire fresh-thinking and emotional balance in your home. The colour purple suggests luxury, creativity, wisdom, stability and ambition ¬– attributes we’ve captured in a blend of carefully-selected natural fragrance extracts, to help you add mood-lifting scent to your home.